Fragtastic Reef ships merchandise Worldwide! Most orders will ship with FedEx Ground, Home Delivery, or USPS, which generally take 1-5 days depending on your location. Even orders under our $29 free shipping threshold will still most likely arrive in under 5 days! Our shipping times are very fast and on average, orders arrive in usually UNDER 3 days. FedEx Home delivery also delivers on Saturdays & USPS even on Sundays in some locations! We are offering FREE shipping on all orders over $29 for a limited time. We will use a combination of different shipping methods via USPS, FedEx, UPS, and any carriers available. Most orders will arrive in 1-7 days of placing an order with a majority of orders arriving in 3 days or less. We now offer a cheaper flat rate shipping option which is FREE SHIPPING on orders over $29. This shipping option will be a combination of FedEx and/or Smart-post for delivery. Delivery times are usually between 2-7 business days depending on delivery location. *Heavy items such as salt, substrate, and larger items for example; aquariums do not qualify for flat rate or free shipping. We ship currently worldwide for most of the products on our website. International customers are required to pay with Paypal and ship to a confirmed address only. There is no flat rate or free shipping with international orders at this time. Shipping laws are different in each country. It is your responsibility to check with your Customs office to verify whether the country to which you are shipping permits the shipment of your products. Fragtastic Reef is not responsible for any direct, indirect, punitive, or consequential damages that arise from improper international shipping practices. Drygoods, Equipment, and Aquarium Supplies: In the case of damaged items in shipping please contact us ASAP. We reserve the right to ship another method if needed. To make sure your product will arrive on time and in good order. If there is a problem with the item after you have received it please let us know. In case of malfunction or warranty issue please contact us for manufacture information. You will then be responsible for warranty issues directly with the Manufacture. Most issues can be resolved between us and the manufacture. Free Shipping does not qualify for orders being shipped outside the 48 US states. Hawaii, Puerto Rico, and Alaska do not qualify for free shipping. If you are located in these areas please contact us for a shipping quote. These locations do not qualify for Flat Rate shipping that we currently offer. Live Fish and Coral must be shipped FedEx Priority Overnight. You must accept and sign delivery on first attempt, to qualify for Arrive Alive Guarantee. We pack every shipment in high quality packing materials and insulated boxes. Arrive Alive Guarantee for Livestock: When purchasing livestock we ship Priority Overnight to ensure alive arrival. In the case of livestock DOA please DO NOT throw it away. You must contact us within 2 hours of accepting package. Item must be sealed in the bag it arrived in. Pictures must be taken of the loss within 2 hours, and emailed to: sales@fragtasticreef.com All DOA and refunds will be a credit towards your next purchase. Please call if you have any questions. 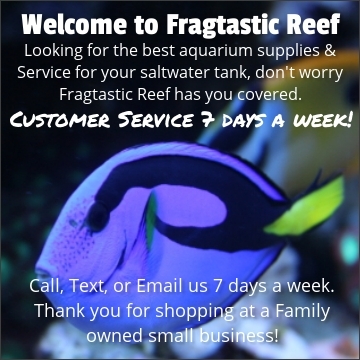 Fragtastic Reef has one of the most relaxed return policy's in the industry. We make getting the right products for your aquarium the easiest we can. If you purchase an item that won't work for your fish tank let us know and we will get one to you that will. Returns must be processed and requested within 14 days after confirmation of receiving the item. Items purchased and that are to be returned must meet all these requirements; Factory sealed in original packaging, not used or damaged in anyway, and all parts/pieces/manuals included. Opened, used, or factory seal broken on the product will be refused for a refund. Shipping charges are charged to the customer, if the purchase qualified for free shipping actual shipping charges will be deducted from the refund amount. It is also the customers responsibility for shipping charges back to Fragtastic Reef when returning the product. Returns are subject to a 10% restocking fee, so please ensure your order is correct before purchasing. Make sure that you order the correct items and please contact us with any questions before ordering. With Flat Rate Shipping $6.99 - Returns will be processed same as above. If order qualified for free shipping we will take the exact shipping cost paid by us and subtract that from the refund total. Refunds on returns will be fully refunded minus the actual shipping cost. This cost of shipping is usually higher than the $6.99 flat rate charge, and we will let you know actual total refund before returning the product. It will take 2-3 business days for the return to be processed once Fragtastic Reef receives the product. If paying with a credit card or paypal it may take up to 3 business days after the return period for your refund to appear on your account. Return options: Store credit, Refund, or Exchange of product. There is NO returns allowed on Livestock for fish, corals, invertebrates, and any livestock. Be sure to pick out your livestock on our website carefully.